A year ago, Army officials were touting a plan to increase the force by 7,500 soldiers in fiscal year 2019. That didn’t happen. Today’s active duty end strength stands at 476,000, the head of personnel management at Army headquarters told reporters on Friday. If that number sounds familiar, it’s because it’s last year’s end strength goal. This year’s end strength target was supposed to be 483.500 in the active Army. “We did miss our accessions target, and we’re going to miss end strength,” Maj. Gen. Joseph Calloway said. 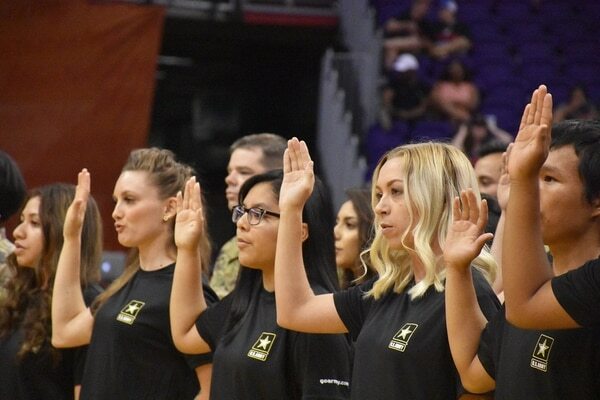 The Army started out fiscal year 2018 with an ambitious task: To bring in 80,000 new active duty soldiers, about 11,000 more than they netted the previous year, when the service made a 180-degree turn from a drawdown to a sharp build-up. A high retention rate dropped that number down to 76,500 in April, officials said at the time. But going into the last week of the fiscal year, Calloway said, the Army had only brought in 70,000 new soldiers. The Army National Guard and Army Reserve did not fare any better. “Our good fortune in retention comes at the expense of the reserve component,” Calloway said, as soldiers transitioning from active duty often move to part-time service. The 2018 recruiting post-mortem comes at a time when the Army is taking a deep look at not only how it recruits, but the standards it has upheld ― or sometimes lowered, in a pinch ― for decades. Notably, this year Army Secretary Mark Esper tightened the number of recruits the Army would accept from the lowest percentile of test scores and other quality measures, from 4 percent of overall recruits to 2 percent. “We honestly left some potential recruits on the table who completely met standards,” Calloway said ― 1,500 to 1,800, he added. Still, the service issued about 7,600 waivers for recruits who had never served before but who, on paper, had a disqualifying medical condition or conduct issue. As of the end of August, that was 1,660 for behavioral or legal issues and 5,062 for physical issues like eyesight, hearing and so on. The recruiting shortages came mostly in military occupational specialties that are already under-strength, like field artillery, air defense artillery, intelligence and satellite communications, he said. The new fiscal year begins in October, and with it comes a new recruiting goal of 73,000. 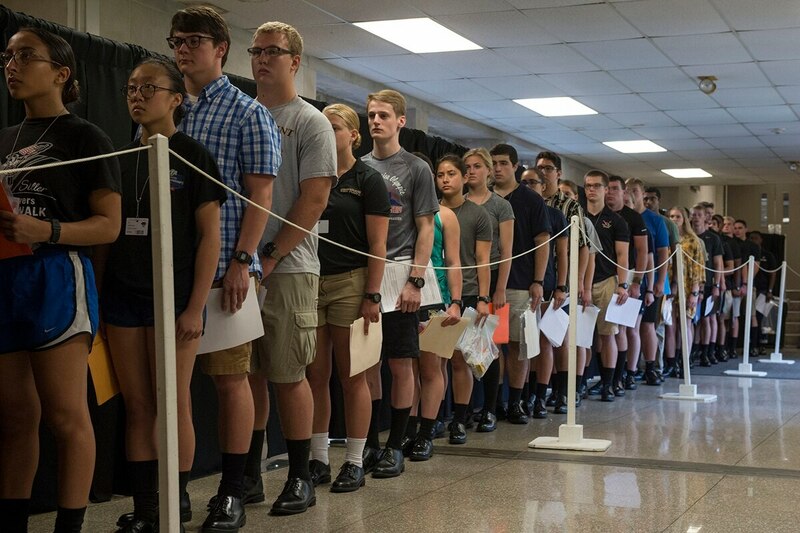 The Army is still offering up to $40,000 in bonuses, two-year enlistments and student loan repayment to get people in the door, but, Calloway said, the service is counting on some other metrics to help it get to that number this year. For one, he said, 2018 was a year of bursting bubbles. A number of senior personnel were made to retire because of retention control points, the service cleared a backlog of pending medical separations and there was an unusually large number of enlistments ending. This year, there are 8,000 fewer soldiers scheduled to ETS, Calloway said. There are also 2,000 fewer medical separations expected. And, perhaps most importantly, retention is already rolling far ahead of schedule: As of September, the service had hit 82 percent of its roughly 50,000-soldier retention goal. The good news in retention has stopped the bleeding of missed recruiting goals, but that balance isn’t sustainable in the long-term. In the past two years, the high retention rate of mid-grade NCOs has helped fix the shortage of squad leaders, but at a certain point, the service could end up with more leadership than soldiers to lead. “There’s no getting around the fact that you have to get those accessions targets, because the shortage is exacerbating in the long term,” Calloway said. Senior leaders often speak of the challenges of recruiting enough soldiers to grow the Army as the population of Americans who are fit to serve and interested in the Army dwindles. Everyone in the Army is a recruiter, he added, and so if there is an event going on in a town where soldiers are living, there should be representatives out there mixing it up. “Wherever we are, if there’s something going on there, that’s where they are,” he said. There are efforts underway to increase advertising in social media and to move or upgrade recruiting stations to make them more attractive, but Training and Doctrine Command is also in the midst of a complete review of the accessions enterprise, Calloway said. “The intent of that is to change our approach and methodology to what we’re doing with recruiting,” he said. The Army is continuing to consider changes to enlistment standards for past misconduct, including marijuana use. Meanwhile, the march toward half a million active duty troops continues. “We feel like we’ve done a number of things to lay the foundation for FY19 in an effort to get at the secretary and the chief’s mission of a 500,000 Army,” Calloway said. The future will also include more conversation with the congressional committees that have been authorizing troop increases and providing the funds to do it. Calloway and other senior leaders spent some time on Capitol Hill this week talking to lawmakers, he said, explaining where the money set aside from a troop increase went and how they would continue to communicate on end strength. In the coming year, he added, the expectation is that they’ll be sending more, and more detailed, progress reports to the Hill.